The year 2003 gave us many memorable events – there was shock and awe in Iraq, the “do not call list” was set in place, Arnold Schwarzenegger was elected Governor of California; Apple launched iTunes; and American Idol, in its second season, introduced the world to two unlikely Idols. Not since Cain vs. Abel, David vs. Goliath, Coke vs. Pepsi or the PC vs. MAC, has a rivalry so split a nation and divided houses – Ruben vs. Clay. These two contestants battled it out, week after week, winning the hearts and votes of millions. Almost nine years later, while the outcome is still hotly debated on the worldwide web, Clay and Ruben have moved forward, remaining best of friends and colleagues. This is the post Idol biography of one of these Idols – Clay Aiken. After finishing a very close second on American Idol (depending on which cue card you read, he was somewhere between 1,300 and 130,000 votes shy of the title) Clay Aiken has gone on to become a fixture in American pop culture. Clay’s debut CD, Measure of a Man (2003), shot to number one on the Billboard charts – garnering a double platinum certification after the first week’s sales. Aiken’s subsequent albums, Merry Christmas with Love (2004), A Thousand Different Ways (2006), On My Way Here (2008) and Tried and True (2010) all debuted in the Billboard Top 10. To date, Aiken’s album sales top the six million mark. That ain’t too shabby for a Special Education teacher from North Carolina. Continuing his love affair with the small screen, Clay has made multiple appearances on The Today Show, The Tonight Show, Good Morning America, The View (as both a guest and as a co-host), Live with Regis & Kelly (as both a guest and a co-host) and Larry King Live – just to name a few. But Aiken’s favorite haunt is on the Jimmy Kimmel Live show, where he has appeared numerous times as a guest and has participated in many memorable skits. Adding to his television credits, Clay has also appeared on Saturday Night Live (2004), Ed (2004), All My Children (2005), Scrubs (2006), Days of our Lives (2006), 30 Rock (2009), Phineas & Ferb (2010) and Drop Dead Diva (2011). 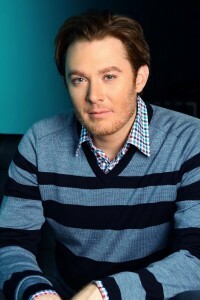 Aiken also worked as an Executive Producer for his 2004 Christmas Special – A Clay Aiken Christmas and co-produced his 2010 PBS Special – Tried & True – Live! But where Clay Aiken truly shines is before a living, breathing audience (that would be “live” in layman’s terms). Clay is at home on the stage and he wraps his amazing voice and personality around each and every person in the room. After eleven tours, Clay has evolved into an incredible live performer, with the rare gift of connecting with the audience and making them feel as though they are part of the show. He has also made his mark on the Great White Way, you know, Broadway. 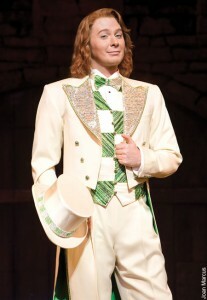 In 2008 he made his Broadway debut in Monty Python’s Spamalot winning over theatergoers and critics alike, and proving once and for all that men with big feet can dance. Named a UNICEF Goodwill Ambassador in 2004, Clay has traveled to such places as Indonesia, Uganda, Afghanistan, Mexico and Somalia in order to raise awareness and much needed funding for children throughout the world. In 2003, Aiken co-founded The Bubel/Aiken Foundation, now known as the National Inclusion Project. Working toward the inclusion of children with disabilities into activities that typically developing children participate in every day, the National Inclusion Project has touched the lives of over 20,000 children in 38 states. This is an updated biography. Previous bios can be read here and here. Error: Error validating access token: Session has expired on Tuesday, 21-Aug-18 16:13:01 PDT. The current time is Friday, 26-Apr-19 02:23:40 PDT.